The National Judiciary Services today paid tribute to the late female judge Catherine Davani in ceremonial sitting of the National and Supreme Court today at Waigani in Port Moresby. 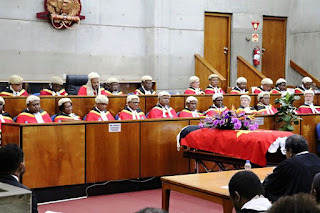 The ceremonial sitting was attended by the Justice Minister and Attorney General Ano Pala, senior Judges, Magistrates, lawyers, staff of the National and Supreme Court of Papua New Guinea and diplomats. “Government made no mistake in appointing her as the first female judge of Papua New Guinea. Her appointment was purely on merit,” said the Chief Justice. Late Justice Davani was appointed judge in 2001 as the first female judge of Papua New Guinea she has 16 years of experience under her belt. Chief Justice Sir Injia said her untimely passing has left a huge gap in the judiciary and will be hard to fill in but she will leave behind a legacy for other females to follow. He extended the judiciary’s appreciation to the family of Late Catherine Davani for allowing her to share her life on the bench.